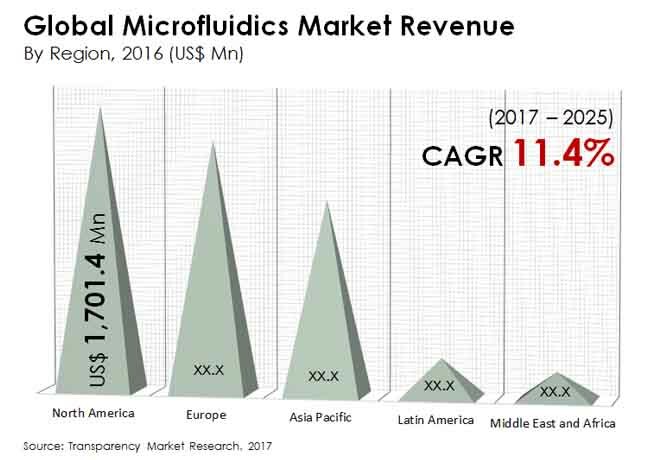 The global microfluidics market is expected to reach US$12.45 bn by 2025 end, rising from US$4.76 bn in 2016. The market is expected to garner a robust 11.4% CAGR during 2016-2025, thanks to the rising demand of Point-Of-Care (POC) diagnostic devices. These devices are in high demand as they provide a safe and low-cost alternative to conventional alternatives. Large population in Asia Pacific and prominence of POC devices in emerging regions is expected to drive growth of the microfluidics market in Asia Pacific. The study presented here is based on a report by Transparency Market Research (TMR) titled “Microfluidics Market (Product - Instruments, Microfluidic Chips, and Cartridges & Reagents; Application - Peripheral Vascular Diseases, Wound Care Management, Pharmaceutical & Biotech Research, In vitro Diagnostics, and Drug Delivery; Material - Polymer Based, and Glass Based; End User - Hospital, Academic & Research Institutes, Diagnostic Lab, and Homecare Settings) - Global Industry Analysis, Size, Share, Growth, Trends, and Forecast 2017 - 2025”.